The leaves in the forest are turning colors and falling. 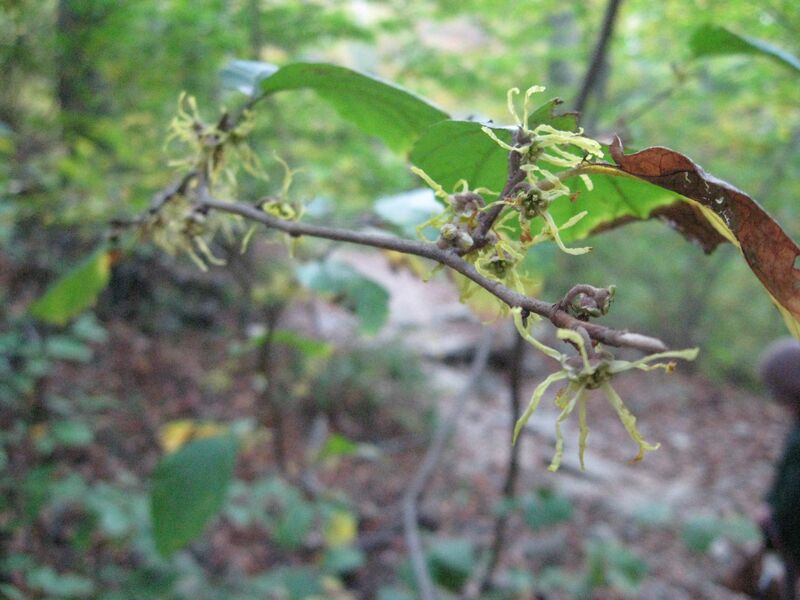 The vase-shaped Witch Hazel shrubs have yellowing leaves and it has blooming yellow flowers! 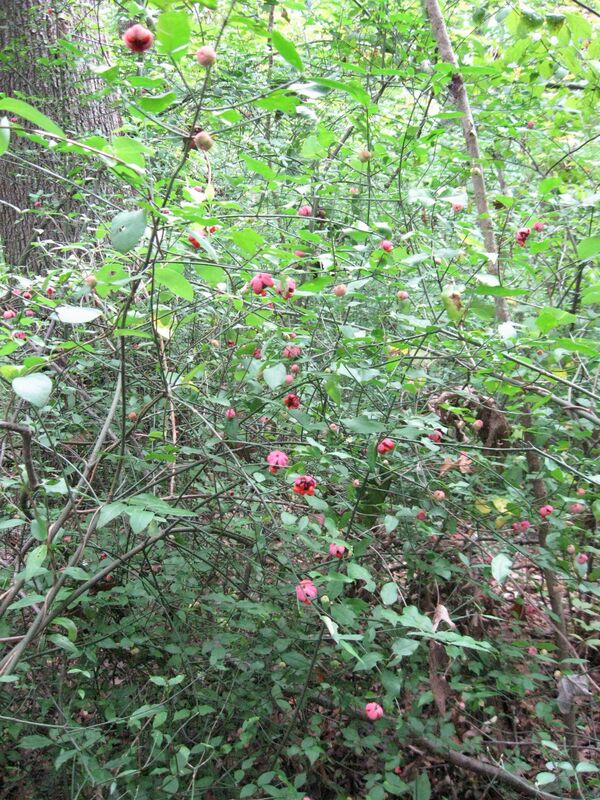 This native understory shrub is going along with the fall program and its flowers can be easily overlooked amidst the backdrop of yellowing leaves. It is hard to believe that it has just produced these fresh yellow flowers while every other plant around is going into winter dormancy. The cold actually helps preserve the flowers, and they stay on longer, giving the plant a whole month-long flowering period. We are cultivating one, and it is a great ornamental shrub that provides plenty of aesthetic beauty to the wintering landscape. In the photo above can be seen the old seed capsules that have ejected the seeds, possibly 25 feet away! 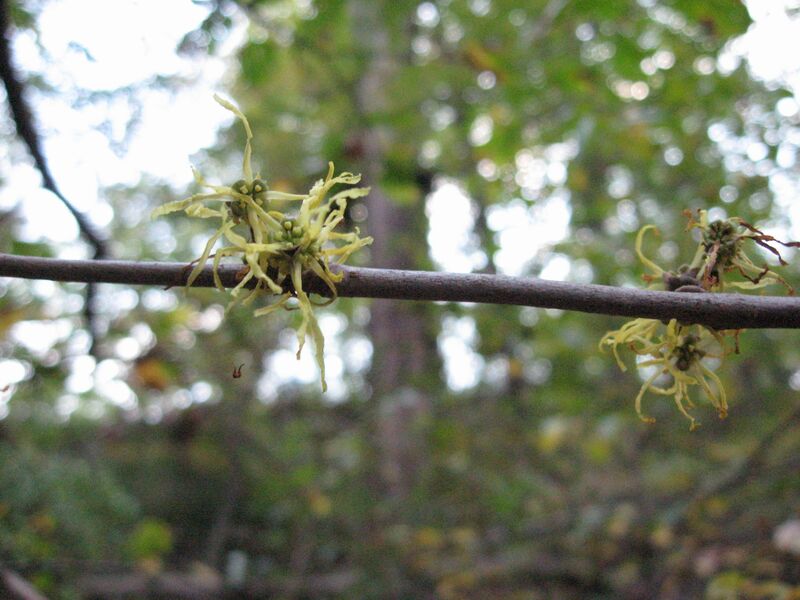 We have a friend who has heard them popping the seed capsules while hiking deep in the forest. 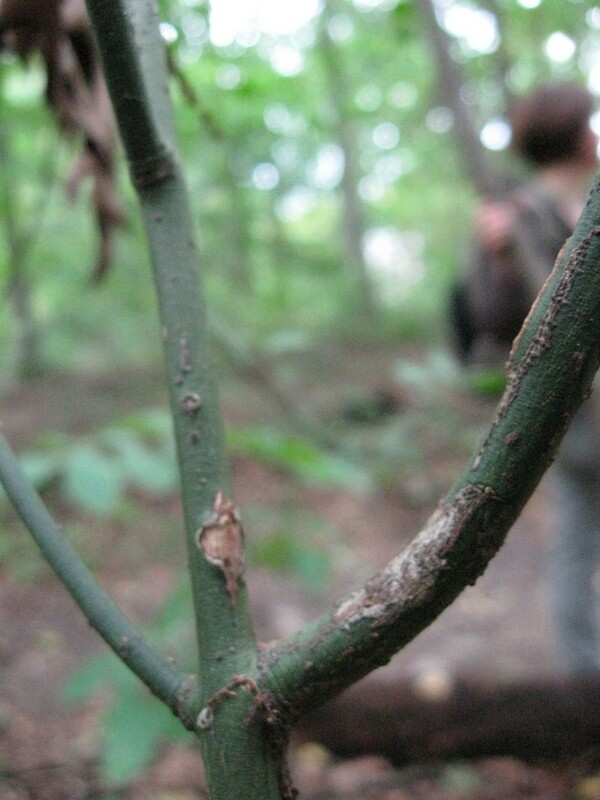 The twigs were used as divining rods, which means they were employed to find water. The bending sticks was called Wiche in Middle English. While no connection to witches, this blooming shrub around Halloween has our imaginations going. Deeper into the forest we ventured and we climbed a hillside, off the more populated trail. It got darker and darker very suddenly. We looked up through a massive thicket of AAAAAAAAAAAUUUUUUUUGGH!!!!!!!! – Japanese Maple! Run for the hills! No! The hills are covered with them. They are everywhere! We’re trapped! The leaves are shading out everything in sight! They are growing like mad! They’ve cross-pollinated! They are reverting to the straight species just like found in the wild in Japan, Korea, China and parts of Mongolia and Russia! 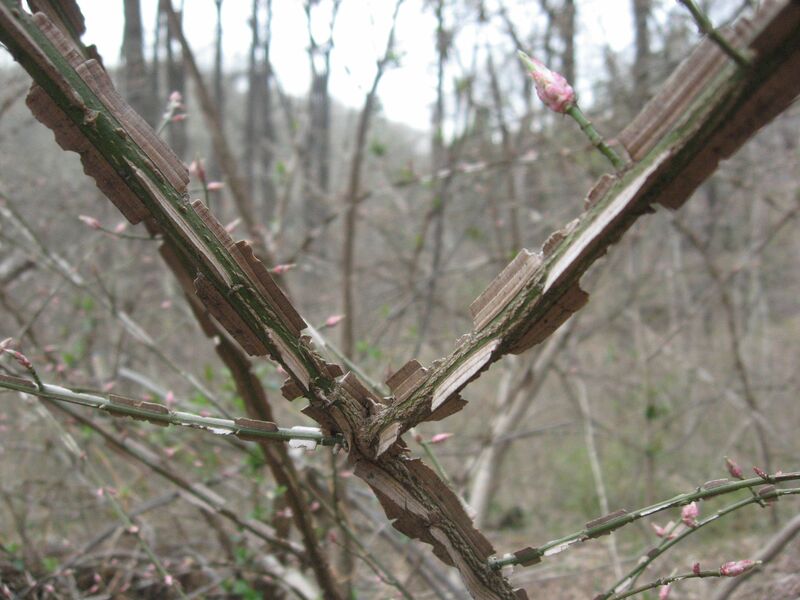 The straight species is not a pretty sight in the natural forest of the Wissahickon Valley. Let’s not panic, while this is a creepy place, there is still a native plant here and there. At least for now. The native plants may be able to lead us out of this horrifying scene. What is more frightening is that if we make it out of here and tell local homeowners about our terrifying experience, they could be dismissive or even hostile. How will we ever explain to them the horrors of escaped Japanese maples in the natural lands without them getting a bit itchy? These trees are beloved garden ornamentals. It costs hundreds of dollars to have a small one in your yard. In some neighborhoods it seems as if they are required plantings! How will we ever explain in the simplest of language that an ornamental cultivar that everyone has in their yard and has a beautiful shape and deep red leaves is now a potential hazard to our natural forests? That it seeds itself prolifically, and it is highly variable outside of cultivation, resulting in green leaves and a non-compact shape and an adaptability to a variety of conditions. 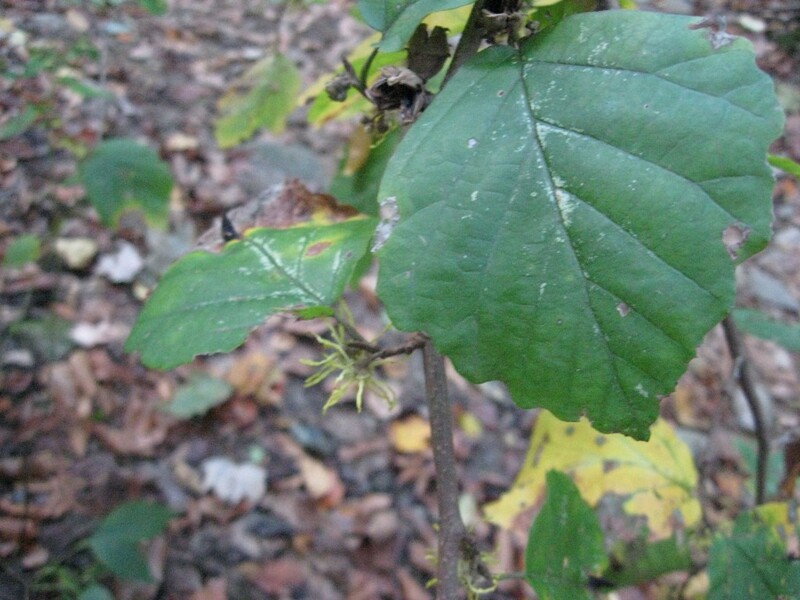 Without any predation (Deer have no taste for it), these conditions are ripe for this plant to become an invasive. 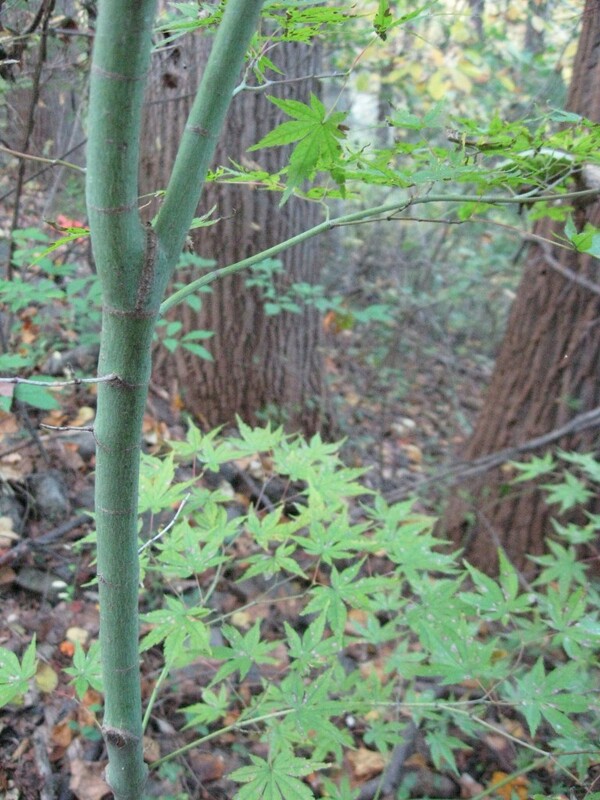 Looking ahead, the future of the lands we come across in life are always facing serious challenges, and when it comes to this emerging invasive, Japanese Maple, it is easy to visualize whole invasions that wipe out native forests in the next 100 years. The Sanguine Root recommends against planting this tree. We survived the invasion of our Sunday afternoon in the Park. We had a Japanese Maple in our yard, which has been removed. We find them frequently in Morris Park, and we yank them out of the soil, and let them die and decompose on the surface of the forest floor, where they will hopefully become a native plant . It is heartbreaking sometimes when we walk through a degraded forest in an urban setting. 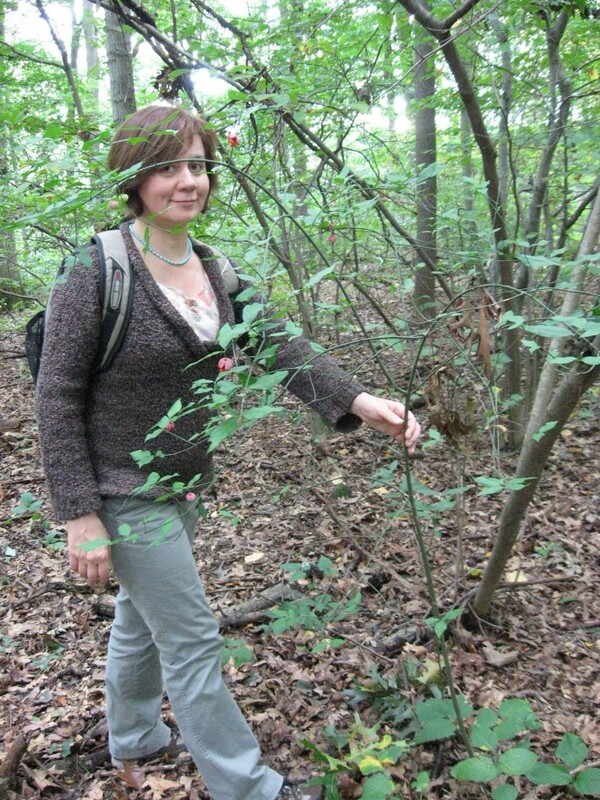 We set out on a sunday looking for good times and a happy woodland only to find weeds from other continents filling up the forest floor, with the remaining native trees cracked, broken and stunted by invasive vines introduced as ornamentals. Our hearts sink heavier when the shrub layer is dominated by the invasive Euonymus alatus, an Asian shrub introduced as an ornamental that has jumped the fence and is rapidly expanding into forests all around our region. 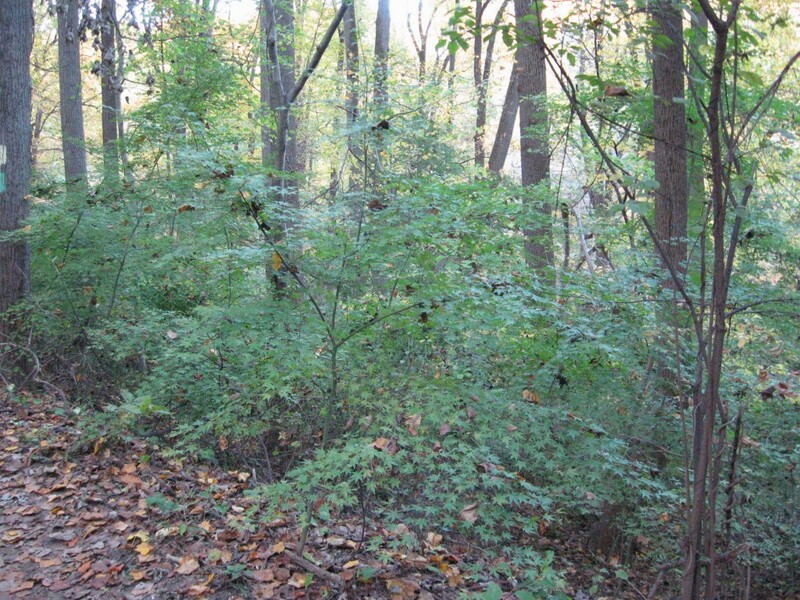 This shrub shades out the native understory, allowing non-native shade tolerant plants to grow. The invasive Euonymous alatus, commonly referred to as the Burning Bush also has a native counterpart, the Euonymous Americana! 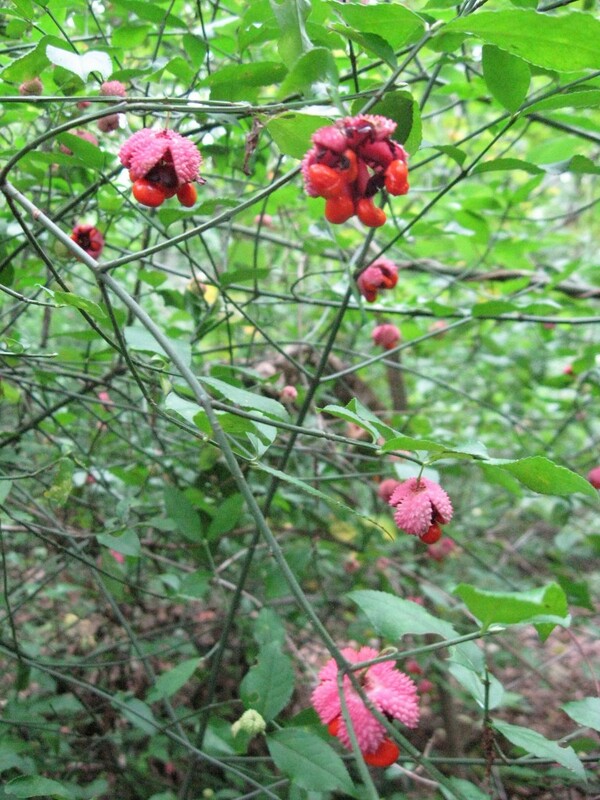 This is the Strawberry bush, The hearts- bursting -with -love, or our favorite common name, the Hearts-a-bustin’. So we are exploring the new and improved trail at Kitchen’s Lane in The Wissahickon Valley Park this fine October afternoon. We are noting the invasives in this one area that are stifling the forest. We notice that as we get closer to a neighborhood, the more invasives there are. Wouldn’t it be great if the folks on this adjacent block could get together and learn about this forest and try to rescue it from this blight? It is even more heart breaking to see that grass-clippings, Christmas trees, and garden waste are dumped into the forest as if this is somehow improving it. The garden waste ends up spreading into the forest whatever trendy exotic plant the horticultural industry has people believing is a must-have. The usual suspects, Pakisandra, English Ivy, Vinca Vine and the Burning Bush. We wonder what used to grow here. We see some blooming Asters and Goldenrod trying to make it past the invasives and begin to feel better. We most certainly did not come here to be depressed about all of the problems, but to see the beauty in nature. We must find the pathway of beauty, and that was on our path! 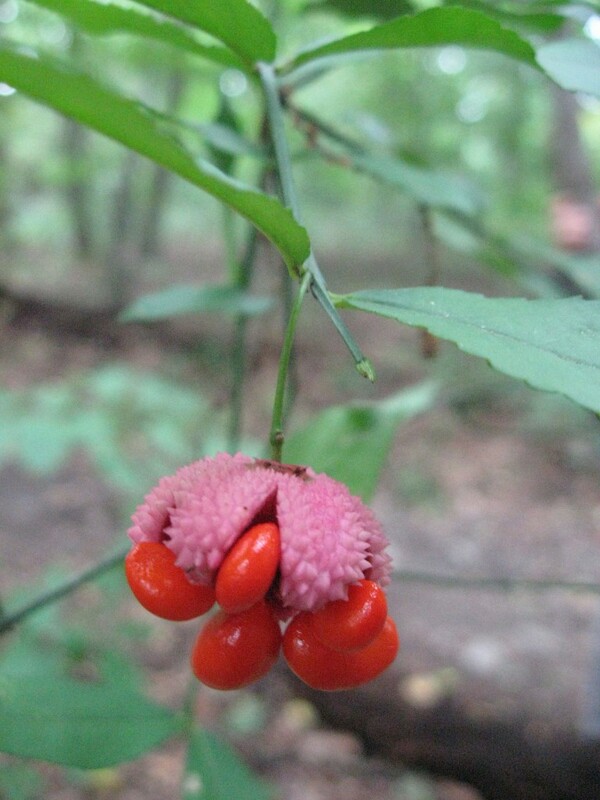 Suddenly through the thickets we found the Hearts-a-Bustin’, the native Euonymus Americana! They were glowing like bright red orbs. Immediately upon inspection Isabelle began to sing the song Hearts-a-Bustin’ , written by Billy Joe Shaver as performed by Jimmie Dale Gilmore. We found out about this plant through this song, which we heard on Whyy’s Fresh Air program, but had never actually seen one until this special day. 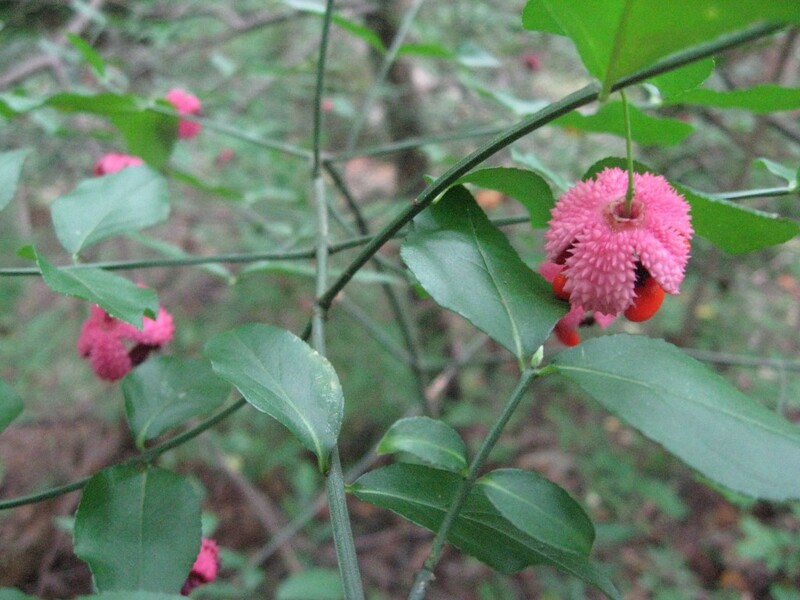 It is the formation of the fruit, not the flower that gives this native shrub its many engaging common names. Seeing a whole colony of them was heart-warming. How to tell the difference between the native Euonymus americanus and the invasive exotic Euonymus alatus: The top picture is the native americanus. It has a green stem. The picture below is the invasive alatus. It has corky wings on the green stem, usually at 90 degree intervals around the round stem. There are differences in the fruits, flowers and leaves, but the most obvious one is the “wings” on the alatus, which can be attributed to its other common name, the Winged euonymus. 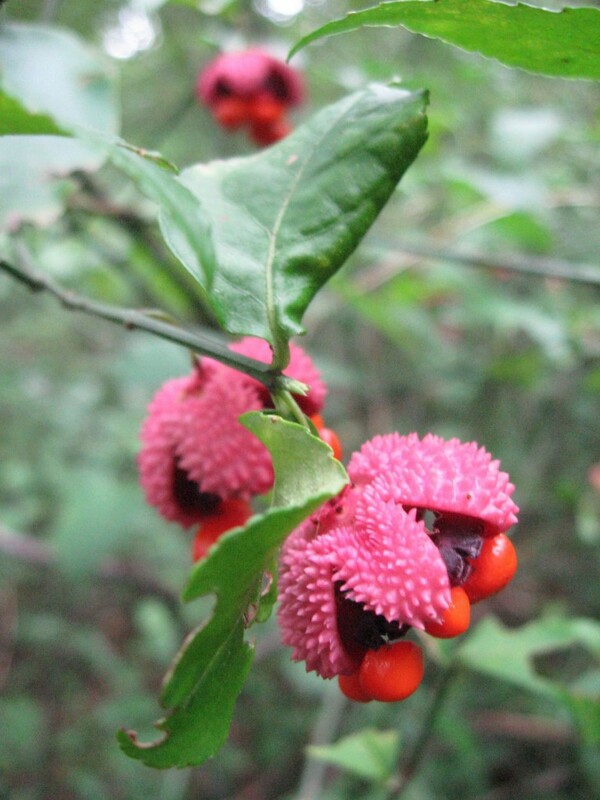 The difference in the fruit is that the native Strawberry Bush has its fruit in a distinct cluster, topped with the bright pink show-stopping shell, that hints at a strawberry. The non-native Burning Bush displays its fruit as individual red berries. 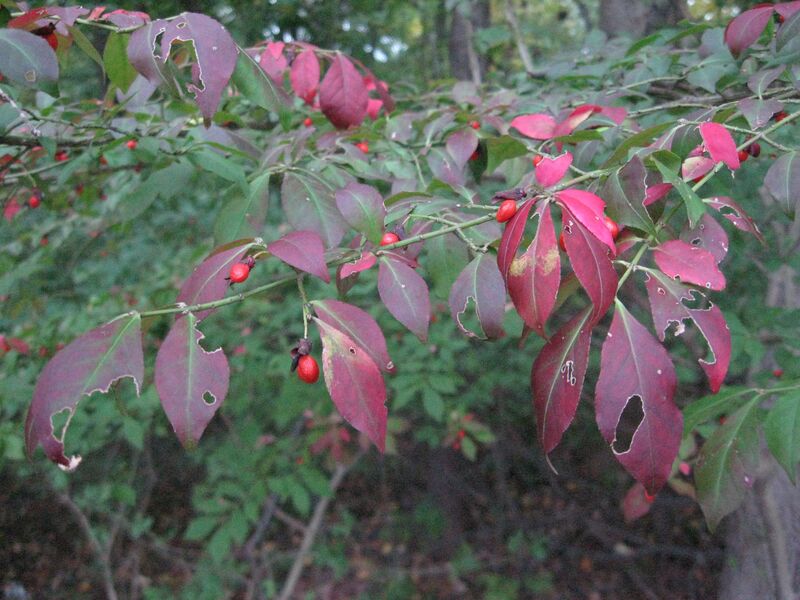 The leaves, if exposed to sunlight, turn bright red in the fall, hence its common name. This characteristic has invited interest from the horticultural industry for use as an ornamental. 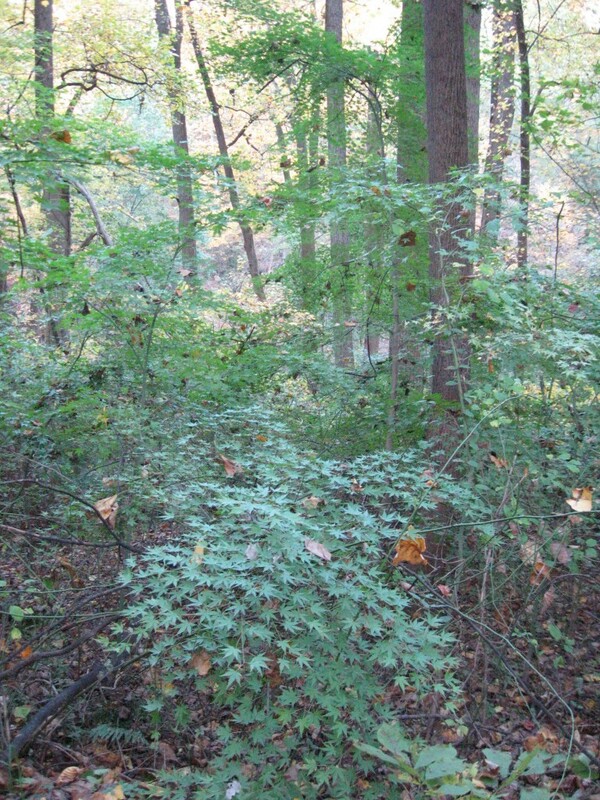 Having escaped from the parking lot of the interstate rest stop, and gas stations across the northeast, it has invaded many a forest where it does not display any ornamental features. Instead, it grows wild, takes over and rapidly shades out native plants, creating an ugly impenetrable thicket . We wish the horticultural industry would promote the native shrub, which we believe is very elegant and stunning. American expats lounging about in Parisian gardens. They live rent-free just because they are unique and exotic Americans. The Parisians lust for them and they show off their prized Americans every chance they can. The Americans feel perfectly content and justified in their exalted status here in France. They are not treated as well in America. They are often brushed to the side in favor of some Asian ornamental plant. This American vine has got the best apartment in town, with the best view. All because it has a beautiful fall color, a deep crimson red, and exotic blue berries on a red stem. It is a great ground cover as well, not to mention its attractive leaves which are highly ornamental. This is a loved American vine in Paris. 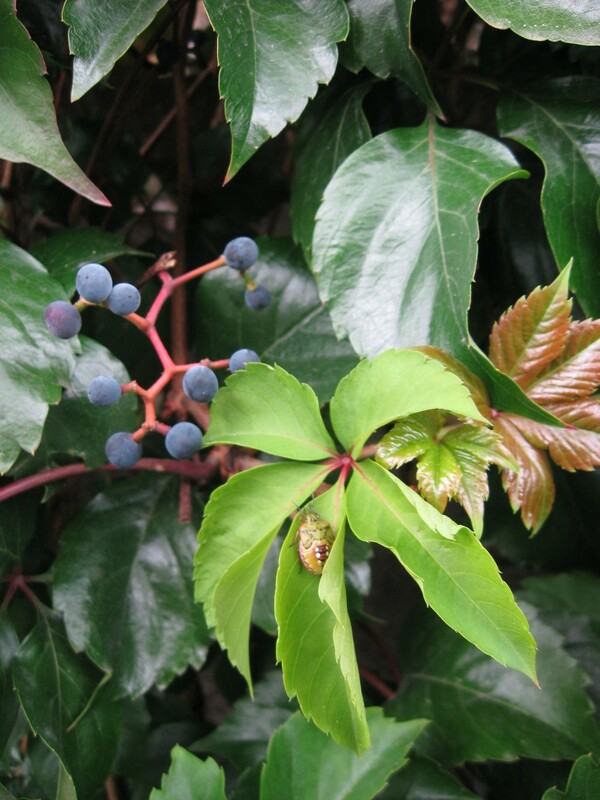 The above pictured Virginia creeper is often brushed aside while the Parisian native vine English Ivy, Hedera helix, gets the hot real estate in Philadelphia. As the saying goes, the grass is always greener on the other side. The Parisians love this fast growing very straight and tall American tree with orange and green tulip shaped and sized flowers. It is easy to see from the French perspective that if well-placed, our Tulip Poplar could be an excellent specimen tree. In this location, there are no buildings that will be damaged from the branches that will inevitably break off in the future. 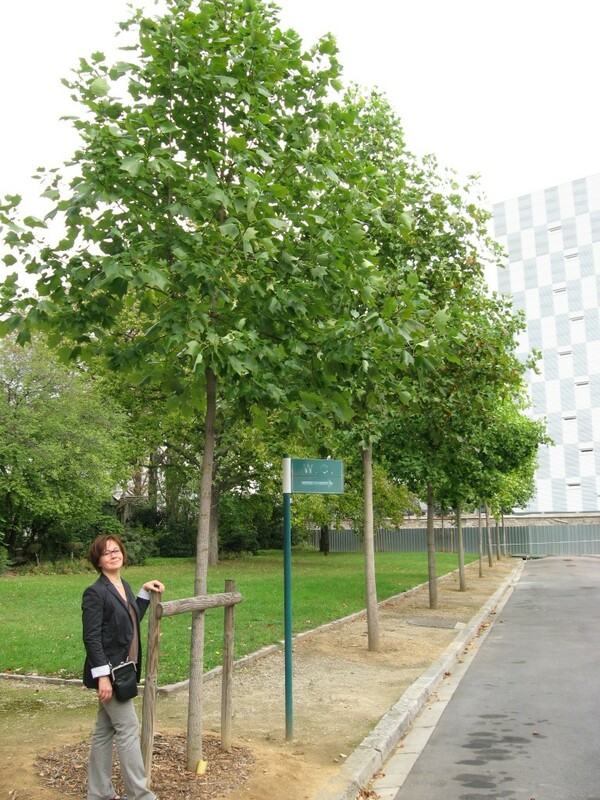 It was so much fun to see our Tulip Poplar being celebrated in Paris. This vine is so common throughout Paris and the south of France that it could be misinterpreted as a native very easily. 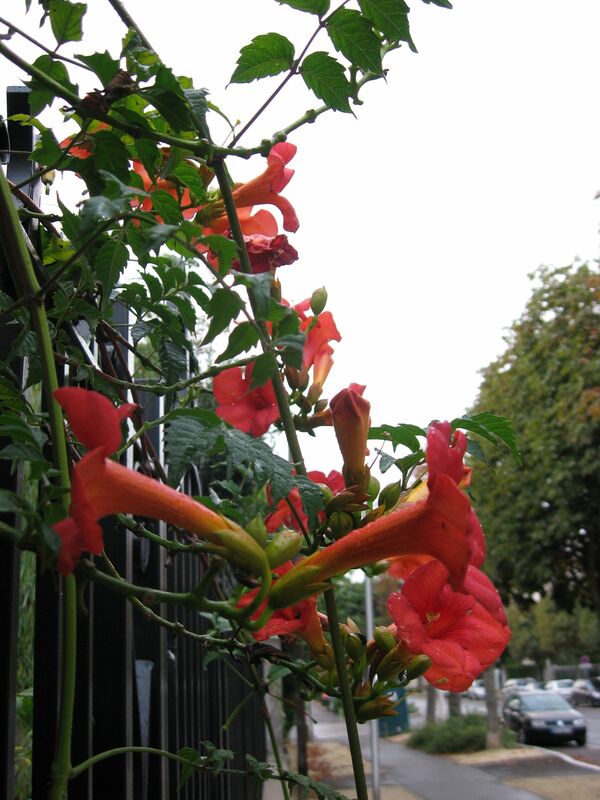 The Campsis radicans vine speaks French with a perfect accent for every region of the country it is grown. It has been introduced and cultivated in France since the 1700s. There are even cultivars of this vine that were originated in Europe! It is loved in France and it loves France! In the south of France, there are old vines with stems six inches in diameter! A botanical Francophile to be sure. We did not see any evidence of it escaping cultivation or becoming invasive either. (but then again, who knows what will happen in the bigger picture). With all of the fanfare and the hype around this plant in France, we cannot ignore the bright red tubular shape of the flower, designed in the process of evolution for the pollinating Hummingbird, a bird that is found only in North America. This is a botanical feature of the plant that is a dead give-away of its North American nativity. As a garden ornamental, the Americans are not very enthusiastic about the Trumpet vine. ( if we are wrong on this in a regional context, please speak up, we want to know the truth). 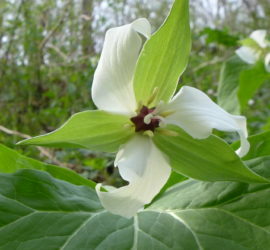 The fact that the French love this plant is somewhat endearing, however we remain skeptical because it is not a native plant to this part of the world. It could still become invasive. 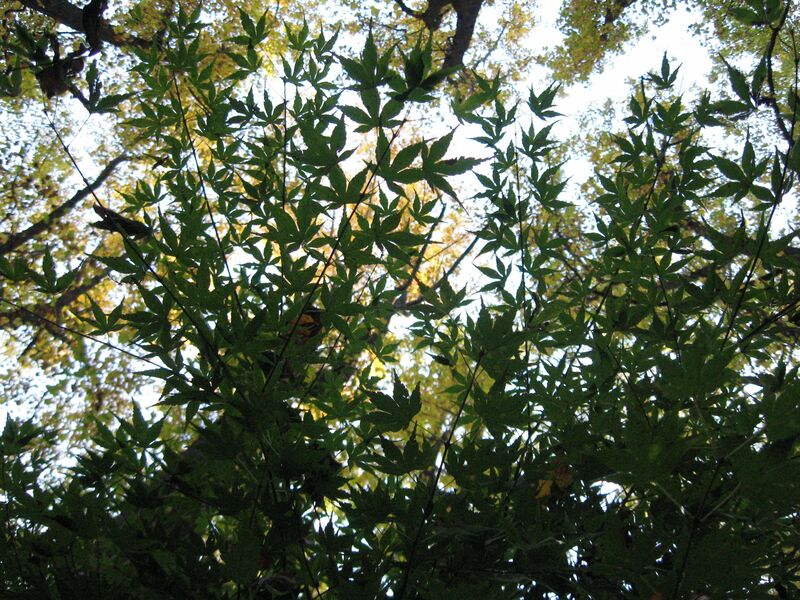 The above picture is the Sweetgum. here it is being proudly displayed as an ornamental in the distinguished Paris suburb of Le Raincy. We ran across this tree in our adventures. 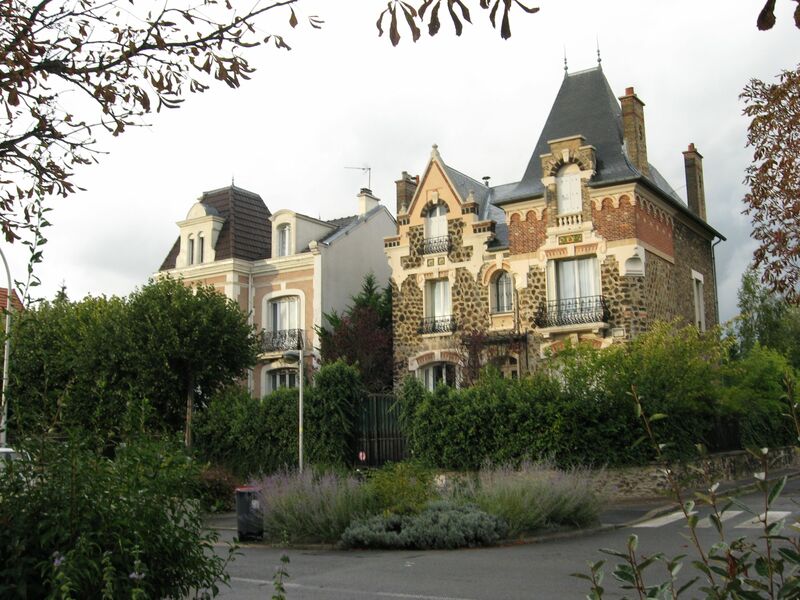 We had taken the Parisian commuter train called the RER to the train station of Le Raincy, a town we had been to many times, the home of Isabelle’s brother. However we had never arrived in Le Raincy from the RER before, and we immediately were lost. We were invited for dinner and we wanted to be on time so there would be no waiting or associated anxieties. We get off the train at the station and we find ourselves in a part of town unfamiliar to us, but full of great architecture. But now we were even more lost. A kind 70+ year longtime resident of Le Raincy directed us in the right direction and even walked with us for 10 blocks until she tired. She sent us toward our destination in this magnificent suburb just east of Paris. We felt so welcome. We were still lost and it was getting late. Dinner was in just five minutes! We viewed and photographed the Campsis radicans, the American trumpet vine along the way, and we stopped at a Jewish grocery and bought a bottle of kosher Bordeaux. Now, we were still lost and completely on our own to find the right street. Isabelle saw the American Sweetgum, liquidamber stryaciflua, in the planted -up median between the tram and the street. (Now we were in familiar territory, because we know this tram line quite well). If Sean sees this we will be sidetracked and even more late. He will want to take pictures, inspect the leaves, the bark, the fruits- I know this tree just from a glance. It was getting dark and we were now running late for dinner and still officially lost, despite finding our familiar tram line. However, the American Sweetgum was planted all along the roadway, between the tram tracks and the automobile road. Sean finally noticed the American sweetgum and immediately stopped in his tracks. Pointing emphatically. Isnt this the Liqiuidamber stryaciflua? The Sweetgum? Yes, I believe it is. Said Isabelle. The picture was taken and the fruit was observed in haste and within minutes we found ourselves in familiar territory, finding the street Isabelle’s brother lives on. Only five minutes late! Just long enough to identify an American plant in France. 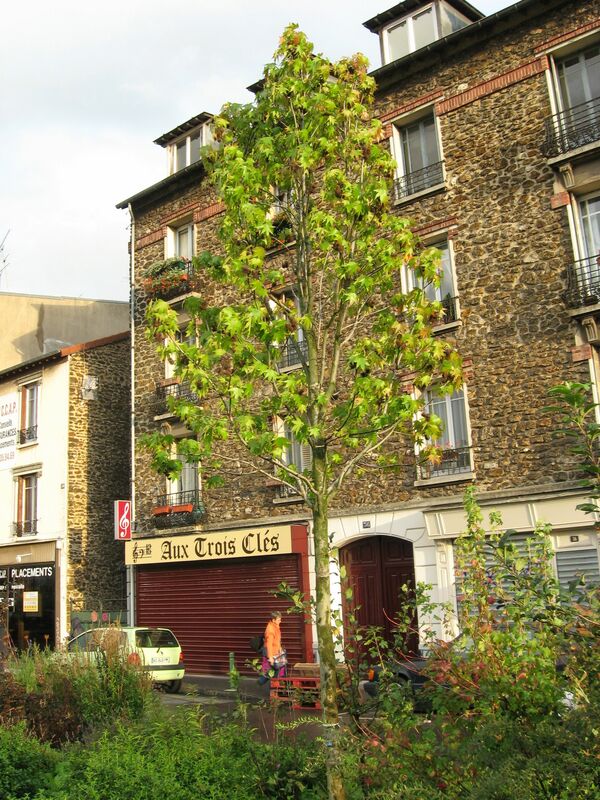 So there we have it, The French love our Liqiudamber stryaciflua, the Sweetgum. The Pokeweed is as American as Ben Franklin, our most famous American in Paris. It has been introduced in Europe for so long that it is found throughout the continent. The dark juice from its berries has be reportedly used as ink to write drafts of the Declaration of Independence. Ben Franklin was a printer and must have known about this plant. 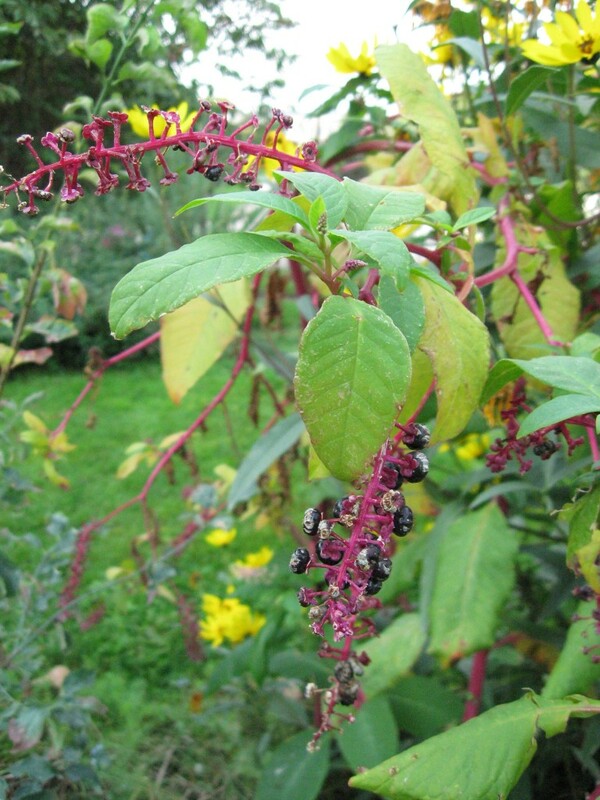 Pokeweed is found throughout France, along the railroad tracks, in gardens as weeds and in cultivation. This plant more than any other, is a living articulation of the long and detailed history between France and the United States of America. 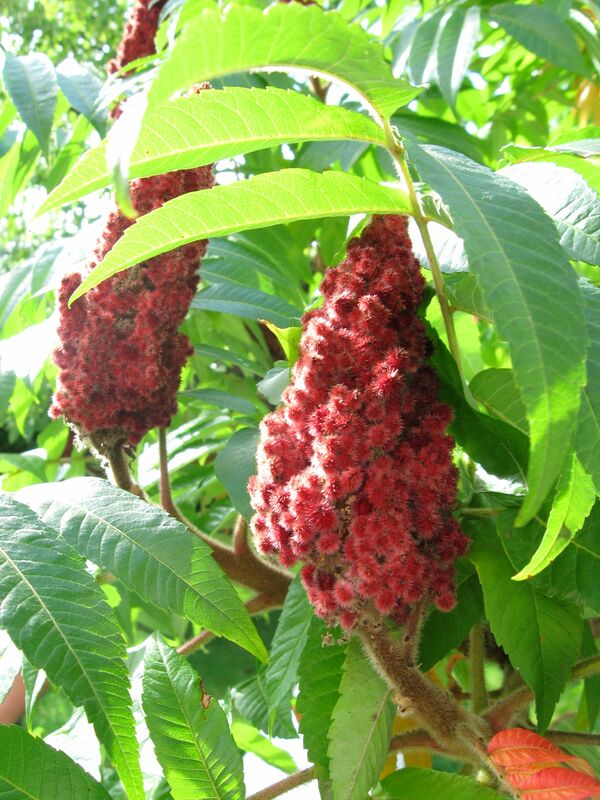 The French have fully embraced our Staghorn sumac as an ornamental. It is everywhere. This is a great large shrub that is almost completely ignored in America. It is left on the side of the road as a weed. From time to time it is found in an ornamental position in the States. In Philadelphia it has been brought into cultivation as an ornamental along the new Schuylkill River Park in Center City. It is great to ride bikes or walk along this section of the river and see the magnificent specimens of Staghorn Sumac being presented as ornamental beauties, only to cross the river at the Art Museum and see them growing as uninvited weeds along West River Drive, just a few paces away! It is somewhat amusing to see plants that Americans dismiss in favor of Asian ornamentals being exalted in Europe. However it’s the same story on the other side of the pond. There was a point in time when having a unique and different plant in your yard was a sign of status, and this boosted the importation of foreign plants. 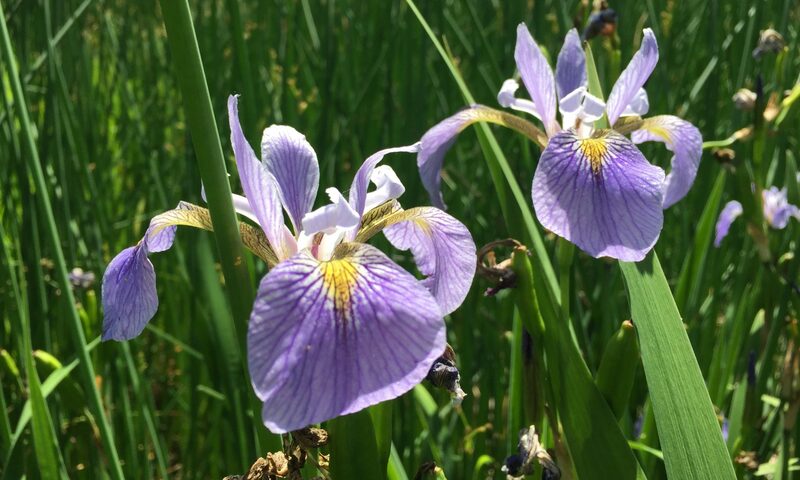 This practice has been carried to such an extreme that it is almost expected to have foreign plants in your yard, so much so that fines are being exacted upon those that grow native plants! 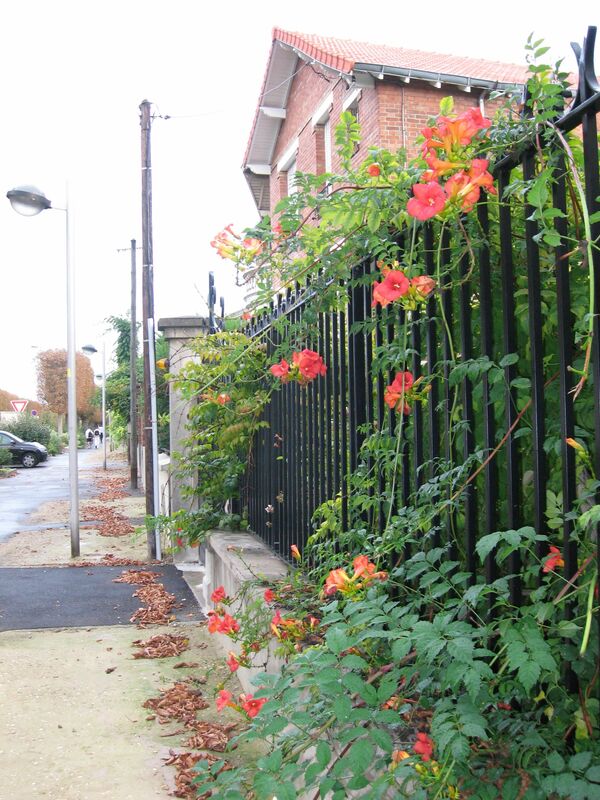 The cultural aesthetic of landscaping is dominated by plants that may look pretty in our yards, but can become severe pests in the natural areas we live amidst, and we are seeing this pattern unravel in France . 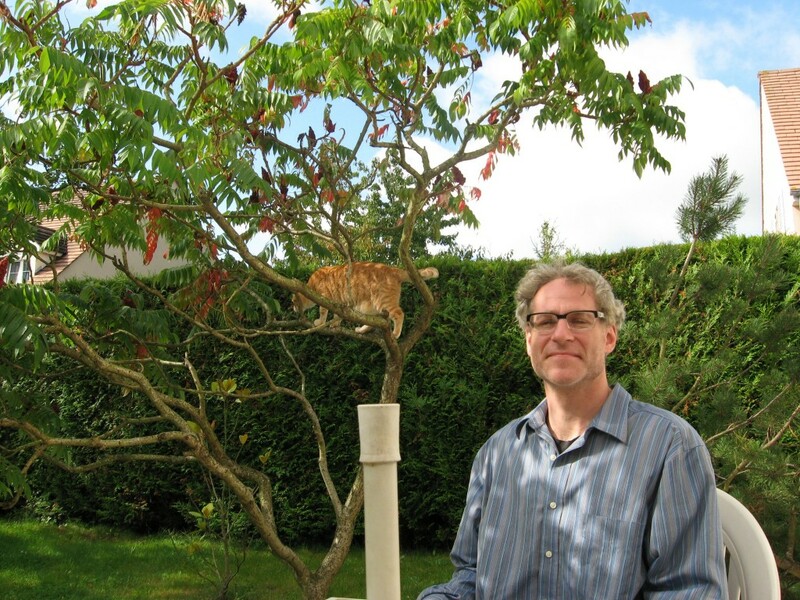 For the most part at this time, most of the invasives in France are Asian ornamentals that have behaved for a few years and then have suddenly gone berzerk, like the Butterfly bush or the Tree- of -Heaven. 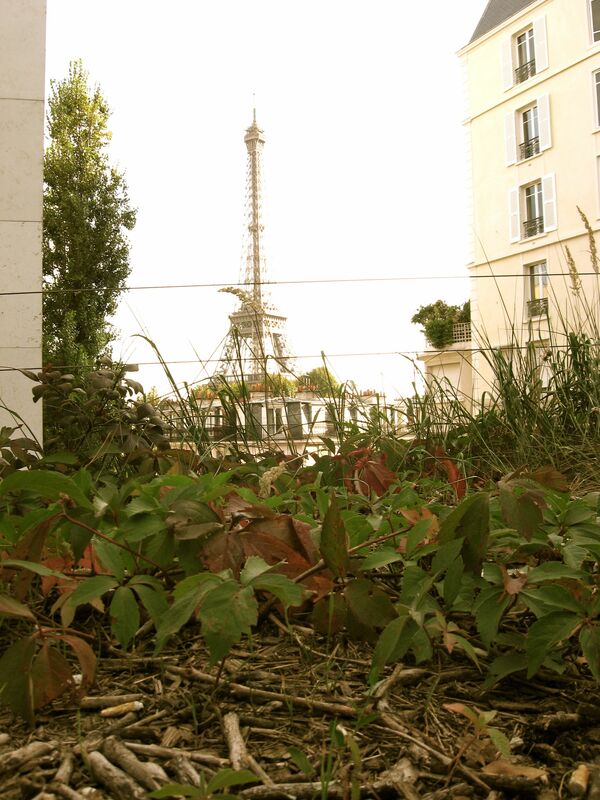 Our native plants introduced in France, in the bigger picture, are at risk of becoming the next ugly Americans.